Molly has prepared a vegetarian stir-fry. She’s begun cooking recently as a way of helping Dina make food she can eat, but Dina complains that Molly’s “fancy vegetables” are too expensive. Molly reminds Dina that they are paid to keep her. Enraged, Dina yells that she’s had “enough.” This time, Ralph’s efforts to calm her make no difference. Dina goes into Molly’s bedroom and comes out holding Anne of Green Gables. She reads the name “Dorothy Power” inside the cover and accuses Molly of stealing it. Dina yells that she “want[s] her out.” Molly packs her things, ignoring Ralph’s reminder that she should wait for social services. Molly focuses on her anger to keep down the “sorrow” she feels. She looks her biological mother up online, only to find that she is still in jail. Molly then decides to take the bus to Vivian’s, if only to sleep in her garage for the night. Molly’s vegetarian meals serve as her effort to express her individual needs while also trying to make things work with the Thibodeaus. To Dina, however, any accommodation to meet Molly’s needs is asking too much. Molly’s retort reveals her sense of injustice at being treated like a burden, when she knows they are compensated for taking care of her. Molly’s desire to leave immediately rather than waiting for social services highlights how much pain she feels in response to being rejected yet again. It also shows her need for some control over the situation. Her underlying sorrow points to her loneliness and sense of constant abandonment. Ballinger-Dix, Elizabeth. "Orphan Train Chapter 32: Spruce Harbor, Maine." LitCharts. LitCharts LLC, 13 May 2017. Web. 24 Apr 2019. Ballinger-Dix, Elizabeth. "Orphan Train Chapter 32: Spruce Harbor, Maine." LitCharts LLC, May 13, 2017. 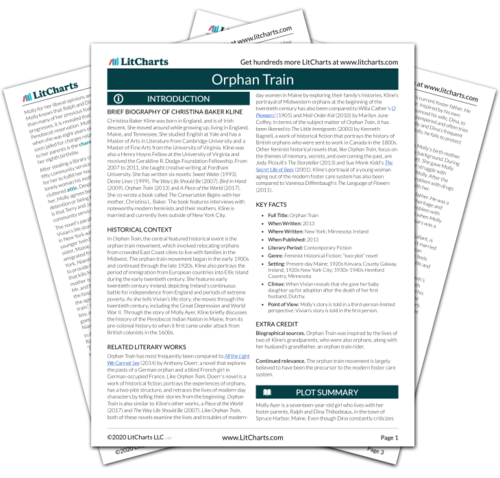 Retrieved April 24, 2019. https://www.litcharts.com/lit/orphan-train/chapter-32-spruce-harbor-maine.